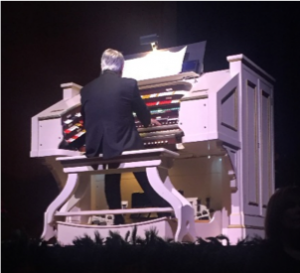 The Story of Christmas was a first of its kind at the Dickinson Theatre Organ Society, presented by DTOS, produced by Bill Church Productions. This was a premier concert, not included as part of the season ticket package. It was truly an artful display of magnificent talent – from dancing and performing arts, to choir, to quartet, to brass quintet, to piano, and, of course, the Mighty Kimball. This year’s show included a new addition – theatrical performance! Ron Stonehouse was unable to attend the concert, so I was pleased to wear my concert reviewer hat once again. 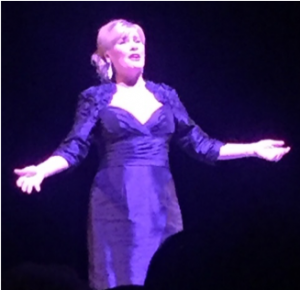 I brought my wife and in-laws with me to these performances, and I asked them for a review of the show – and they LOVED IT!! This was the first time that DTOS offered a Sunday matinee as well, which seemed to appeal to many. The show opened with one of my favorites – Leroy Anderson’s A Christmas Festival with John V. Baratta on the Mighty Kimball, featuring Joy To the World, Deck the Hall, God Rest Ye Merry Gentlemen, Good King Wenceslas, Hark! The Herald Angels Sing, Silent Night, Jingle Bells, and Adeste Fideles. The members of the combined choirs of St. Joseph’s on the Brandywine and the Brandywine Singers, directed by Mary Ellen Schauber, joined the organ for a beautiful rendition of Silent Night. 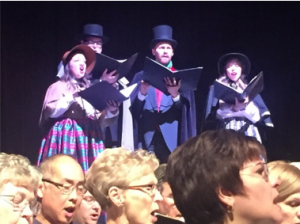 While the Brandywine Brass Quintet played The Holly and Ivy, a traditional British folk carol, Bill Church debuted on the stage of Dickinson High School. Suddenly ladies dancing with hula hoops, donned in peppermint costumes danced to selections from Tchaikovsky’s The Nutcracker, followed by the organ, quartet, choir, horns, and piano with the 1850’s English carol Here We Come a Wassailing. John Baratta and the Dickinson Kimball offered a beautiful version of What Child is This, highlighting the various soft, beautiful voices of the Dickinson Kimball, and featuring soloist Mary Ellen Schauber. Another one of my favorites of the evening was the horns of the Brandywine Brass as they played Mary, Did You Know? Transitioning back to organ, and joined by the Quartet and full choir on the chorus, the audience was delighted with God Rest Ye Merry Gentlemen, followed by a piano solo of I Heard the Bells on Christmas Day, performed by Dr. Michael Marinelli, headmaster of Archmere Academy. The Quartet, full choir, organ, piano, and brass performed the Irish Wexford Carol. 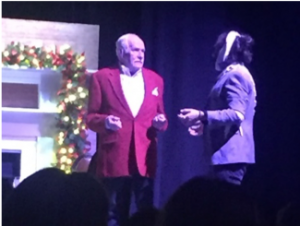 Afterwards, as Dr. Marinelli played a version of Good King Wenceslaus on the piano, Bill Church and a surprise, uninvited guest, the Ghost of Christmas Past, surmised that although Bill was a very kind and generous man, something was still missing in his life. But what is it? The full choir, brass, and quartet and piano joined in. Next up, the choirs, quartet, brass, and organ with a magnificent version of Deck the Hall. Bill found out from the Ghost (Joel DeMartino) and from Scrooge (Ethan Sharp) himself that in order to learn to love others, he must first learn to love himself. That brought us to an organ and piano duet of O Holy Night. Now, as Bill has a deep desire to be with family, Mary Ellen Schauber sang I’ll Be Home for Christmas to the organ. And to remember the friends and loved ones who have left us, the spotlight moved to the American Flag as the Brandywine Brass performed Dvorak’s Going Home from Symphony No. 9 in E Minor. Another one of my favorites, the 16th century Coventry Carol, was performed by the organ, piano, and quartet, and choir, later joined by the brass. Back to a full stage theatrical production, dancers from the Longwood Performing Arts joined the brass, organ, and choir for a jazzy, up-tempo version of There’s No Place like Home for the Holidays, followed by an a capella version of one of the most popular Christmas songs of all time – White Christmas, later joined by the organ and a tenor soloist from The Brandywine Singers, and then the choir. Bill has come to realize that the best way to understand something is to teach it to someone else. Now he is beginning to realize who he is and he is actually enjoying the Christmas season for the first time! Clement Clark Moore set the image of Santa Claus in children’s minds forever in 1822 with his monumental poem, A Visit from St. Nicholas. Today, we know it by its first famous line, T’was the Night Before Christmas. 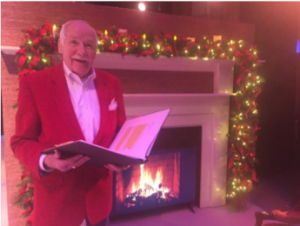 As Dr. Michael Marinelli played O Holy Night on piano, Bill read the famous poem, in its entirety, to the audience. I usually read this to my kids on Christmas Eve – having it read to us that night, to me, was a very special moment. Bill, is Santa Claus real? Bill responds, “Well, I think it’s best to let you see how The New York Times answered that. You see, a little girl asked the same thing some years back. And the editor wrote one of the most famous editorials ever. He answered her question for once and for all.” Bill then read the New York Times’ response entitled Yes Virginia, There is a Santa Claus. Joel DeMartino and the Philadelphia-based band Moonstriker performed an original piece – The Longest Night of the Year. There was no appearance of the ghost of Christmas Future. But if he did appear, he would have helped Bill understand what Bill has left out of his life. Bill says, “You see, I have never been able to really love, and it’s because I have never been happy with who I am. And I have learned that love is what matters to this world, it’s what draws us together to fight hate, and greed, and evil of all sorts. I now understand that in order to love someone else, I have to love myself! I must be satisfied with who I am, forgive my own shortcomings, and be happy with who I am. That’s not easy! But, you know, we have to start somewhere!” Bill picks up the phone and begins to call his friends, including his friend John Washburn to an impromptu party at his home. As the organ plays the bridge to Deck the Hall, party guests begin to arrive including John. Bill has taken the giant leap of accepting himself for who he really is, and has invited his friend over for a party. There will be other friends there, but John is who really matters to him. For the first time he has realized who he really is and accepted it. Just then, the dancers arrive to the party and dance to Jingle Bell Rock with John Baratta on the organ. Honestly, it was like being at Radio City Music Hall. Bill proclaimed, “Now this is a festive occasion! I am learning to change what I can change, and to accept what I cannot change. That is, in my case, who I really am. Now I have much to celebrate, but so do all of you! We have choices about how to go through life; we can wallow in self-pity and be miserable, or we can celebrate our lives as we go through each day. Consider me the ghost of Christmas Future as I encourage you to make the best of the rest of your lives! Especially at this wonderful time of the year, let’s all make an effort to forget our perceived wrongs, and mend the bridges of love that have fallen into disrepair. We must not mistrust, fear, or hate others because of the color of their skin, or who they worship, or who they vote for, or who they love. Instead, show them love and acceptance for who they are. Believe me, that will help you accept who you really are, and then you too are free to love others as you should. Step out with your friends, enjoy life! This calls for a celebration! Maestro, If you please, FESTIVE MUSIC!” to which the full ensemble, including the dancers, performed Bring a Torch Jeanette Isabella, again, one of my favorites of the night. The encore for the evening was Joy to the World, but not exactly the version you would expect at a Christmas concert. Rather, the organ, piano, and Moonstriker Band opened with the Three Dog Night version (Jeremiah was a Bullfrog…) as the place was rockin’! Quickly, though, it transitioned into the more traditional version with full choir, brass, and dancers. AWESOME!!! Writing a review for a performance like this was very different from the typical DTOS organ concert. My mother-in-law said that she felt like she was sitting in Radio City Music Hall, but I quickly reminded her that RC does not have the 4th largest theatre pipe organ in the world! 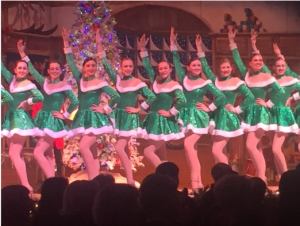 I was just so amazed at the amount of talent on display at these performances – from the musical artists and performers, and the stage crew – and everyone who helped make this performance truly spectacular. Thanks to everyone who helped to make this a truly special event. It definitely put my family and me in the Christmas spirit! And to Bill Church and Bill Church Productions, thank you for bringing your talent and vision to DTOS.